Blowout Sale! 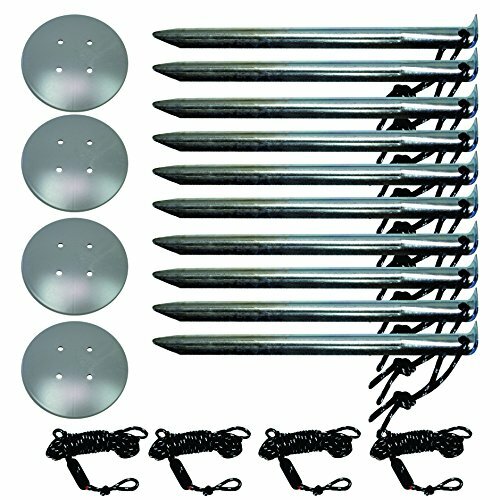 Save 58% on the NTK Camping Tent Sand Anchoring Stakes, 10 pack Tent Pegs 10'' Strong Hardened Galvanized Steel tent stakes with looped strings and 4 ABS Anchoring Disk Plus 4 Reflective Ropes for Outdoor Camping. by NTK at Kerinci. MPN: 302130. Hurry! Limited time offer. Offer valid only while supplies last. HIGH QUALITY AND STRENGTH: Built using Hardened Galvanized Steel, the NTK Tent Achoring System is light, strong and innovative. You won't have to worry about the hassle of a broken, bent or rusted tent peg in the great outdoors, when you need them most and your pegs won't pop out of the sand anymore. A MUST HAVE: This anchoring system was designed to secure your tent or canopy in sandy soils, such as beaches and river banks. 4 FREE reflective ropes are included. NTK ANCHOR DESIGN: Our "Y" design steel tent pegs penetrate and hold firmly in a wide range of soil conditions. You'll have no worries about being blown away when anchoring your tent with them plus the super anchoring disk, design by NTK, this disk is amazing when it comes down to holding down a tent in the sand. • ✔ YOUR CHOICE: Our Outdoors is under threat from many factors and you as a consumer have THE CHOICE to vote for a low impact brand and NTK Outdoors, with others, has a strong mission to REDUCE WASTE as much as possible. You are the DIFFERENCE and we encourage you to read more online, NTK strives to make the very best camping tents and other camping solution with the minimal impact on nature. • 100% MONEY BACK GUARANTEE: You are protected by a LIFETIME, no-questions asked, money back guarantee along with world class NTK Customer Service! Check out our full range of products from Hammocks to camping tents, sleeping bags and much more. NTK, 43 years building a life style. If you have any questions about this product by NTK, contact us by completing and submitting the form below. If you are looking for a specif part number, please include it with your message.